Below your feet, the earth bubbles. 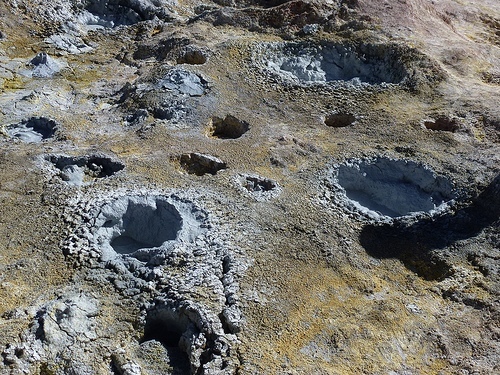 Vapor seeps and liquids spew out of shafts and cracks, while the freezing air bites at every bit of exposed skin. 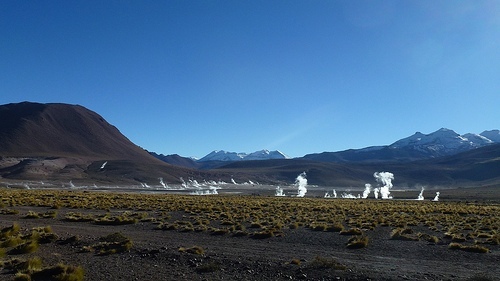 It bit at my skin, at least, as I was unprepared for the chill at 4,320 meters before the sun rises. I was so focused on waking up at 3:30 a.m. for the ride that I hadn’t even thought of bringing a hat. 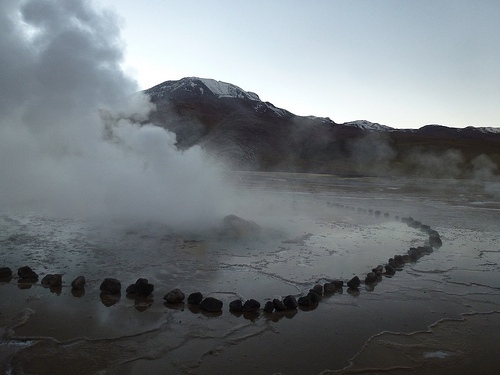 I did bring my swimsuit, however, for a dip in the high altitude geothermal spring once the sun rose and the plumes of vapor began to slowly dissipate. 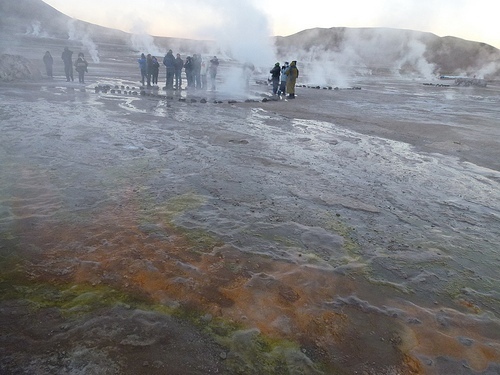 Geyser El Tatio, we were told, is the highest active geyser field on earth. 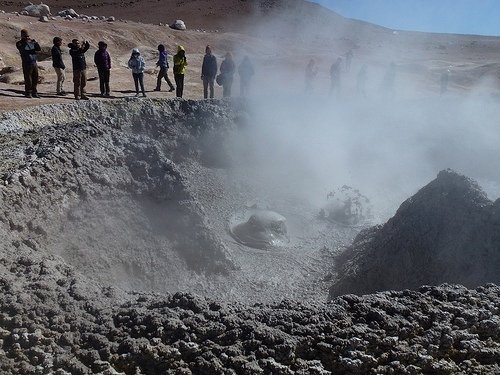 This came into doubt when we toured an even higher geothermal field in Bolivia two days later. 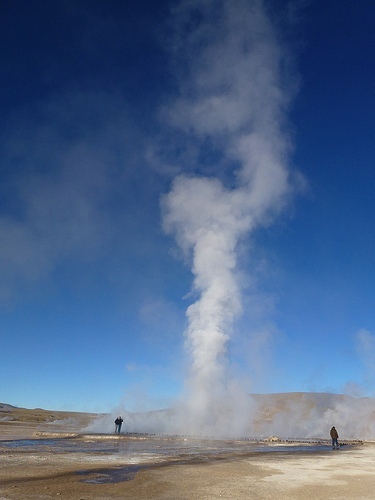 Nonetheless, the ghostly mist is quite a sight before it gets warmer and the steam becomes invisible. 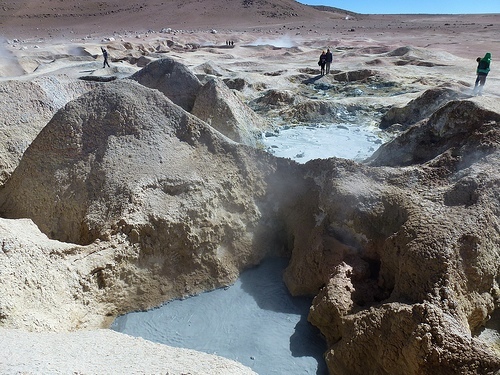 Unlike El Tatio, where little circles of stones delineate where it’s safe to walk, Sol de Mañana is a collection of festering, boiling and bubbling mud pits and gas vents. 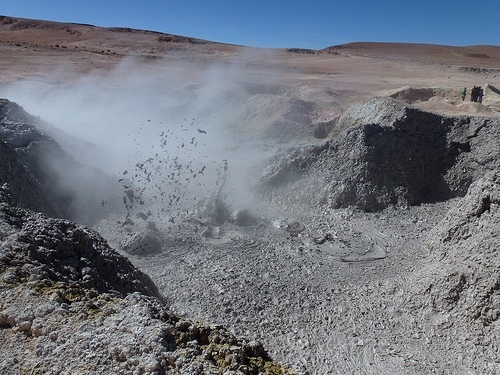 It’s easy to get close to the action here and wander between deadly pits of hot grey sludge, as the melting earth clings to your shoes. One could fall in, if so inclined, or so delirious from the altitude. 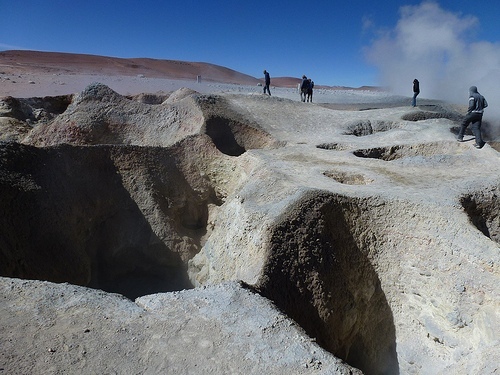 It’s a spectacular and odd experience to meander among solid, melted and melting minerals, high from the lack of oxygen to the brain, taking pictures with other tourists and wondering if anyone’s going to fall in. 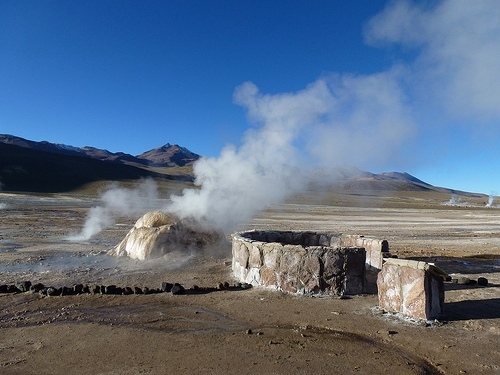 This entry was posted in Bolivia, Chile and tagged Bolivia, Chile, El Tatio, Geyser, Sol de Mañana by hermshu. Bookmark the permalink.